Skid resistant top and convenient carrying handle. 300 lb. weight capacity. 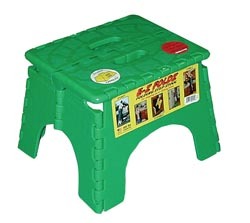 These step stools are 9" tall and fold to an easy to store 2" width! Convenient for reaching all those high cabinets. Choose from 10 different colors (See Chart Below). *Step surface is 9"H x 10-5/8"W x 9"D open. *Base is 12-1/4"W x 10-7/8"D open.